AX2-212 $1199 110 watt 2x12 guitar combo, stereo. TubeTone classic tube modelling. Fully programmable. Digital stereo FX, 26 amp models, 5 stomp-box models, MIDI I/O, cabinet simulation output. Guitar Player April 1997. Floor Board foot ctroller $300. FB4 4-ch ftsw $79. software $99. Load any of the amplifier's 128 programs for full real time editing without having to refer to owners manual. Programs can be saved to the computer's hard drive, or saved to any of the amplifier's 128 program locations. Program selections can be switched from the editor allowing complete remote programming. Save and load BULK data (ALL 128 programs including global parameters). >Thanks for adding a cool link to your web site. The editor is doing well. I have sold as many copies overseas than I have in the states. 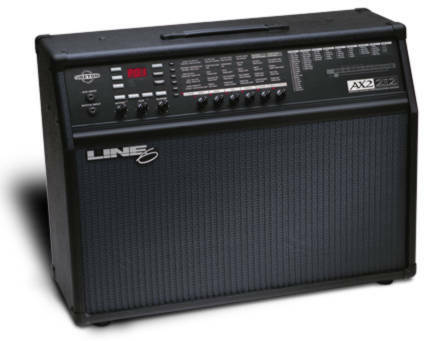 I didn't know Line6 got around so much!